Injuries, diseases and disorders of the ankle and foot can benefit from being treated by a specialist. 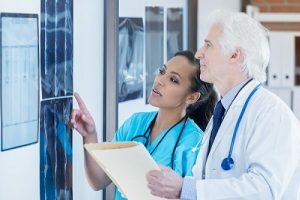 If you are like many people trying to navigate the healthcare system in the United States these days, though, you are likely to be confused about which specialist — a podiatrist or an orthopedic surgeon — will provide you with the best outcome. An orthopedic surgeon that specializes in foot and ankle surgery, such as the board-certified physicians that comprise our medical team at Southeast Orthopedic Specialists, each have five years of intense surgical training. Additionally, our medical doctors have advanced training in foot and ankle surgery. In many cases, patients have other medical problems that are related to, or the result of, their foot and ankle issues. An orthopedic surgeon is skilled and knowledgeable in the mechanisms of the entire body and can address these concerns as well. What is a Podiatrist vs Orthopedic? A podiatrist must first obtain an undergraduate program before completing a four-year podiatry program. Afterward, the podiatrist must successfully pass examinations on the state and national level. At this point, the podiatrist can become licensed. A podiatrist is not necessarily equipped to perform surgery, though. This requires additional study, training and experience. For the most comprehensive coverage in the area of diseases and disorders of the foot and ankle, you’ll obtain results that exceed your expectations when you seek out an orthopedic surgeon. At Southeast Orthopedic Specialists, each office also has physical therapy to provide a seamless continuity of services for their patients. From total ankle replacement and deformity correction to foot fractures and treatment, the orthopedic specialists at Southeast Orthopedic Specialists are ready to help you on your way to recovery. Contact us today for more information or to schedule an appointment at one of our six convenient locations.